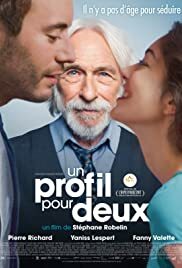 Director: Stéphane RobelinWriters: Stéphane RobelinStars: Pierre Richard, Yaniss Lespert, Fanny ValetteSummary: Pierre, a 75 year old widower, discovers online dating websites. Using the profile picture of Alex, his grand daughter's boyfriend, Pierre meets Flora. Charmed by his elegant conversations and intimate confessions, she asks him on a date, face to face. Excited by this unexpected adventure, Monsieur Pierre asks Alex to go in his place.